The 28′ center console in Los Suenos marina went out on the 28th of August for a full day offshore…they were about 30 miles out between the corner and the craters and they raised 9 sailfish and caught a couple yellowfin tuna. It’s a good day of Costa Rica sport fishing when you get some big game fish for action and then a little something for the dinner table like some fresh yellowfin tuna. One of my buddies went out on a private boat with his family and did some near shore fishing down at the 26 rock. They did a half day and ended up with 4 nice wahoo in the 20 to 30 pound range. They also caught some tuna mack and jack but most guys don’t count those. The 28′ center console was also at the 26 rock in the morning and they caught a couple wahoo and some small tuna…then they trolled out to about 36 miles and found a pack of yellowfin. They caught 4 or 5 yellowfin tuna in the 60 to 80 pound range. I’m hoping to stop by his house later today and pick up a slab of fresh tuna…I have my wasabi and soy sauce ready. The guys in the 28 center console have gone out a few times recently south of Jaco and fished the 26 rock and then trolled the drop off back home. 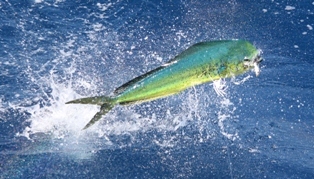 They have been averaging 3 or 4 wahoo, a few small yellowfin tuna or a few small mahi mahi and a sailfish or two each day. I heard there was some red tide around the Tamarindo area and that has slowed the bite. The boats that are going offshore from the Jaco Beach area are getting some fish. One of the 42’s caught 2 blue marlin yesterday and the other 42′ has been catching yellowfin tuna from 20 to 150 pounds about everyday they have gone out lately. The 36′ in Los Suenos did a half day inshore trip recently and ended the day with 3 roosterfish and a jack or two. The 38′ in Quepos released 3 sailfish and kept a couple tuna for dinner. The pic above was sent in by one of our friends. 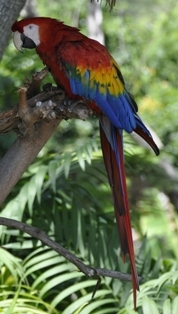 There other day there was 30 or 40 of these in an almond tree by my house. They are beautiful but sure make a lot of noise. Thanks for the pic. A group that fished this weekend went offshore on the 32′ Custom and didn’t do very well. They said they enjoyed the boat and had a good time but the fishing was slow. The next day they went inshore and bottom fishing on the 36′ Express…they caught a mixed bag of roosters, jacks, snapper, grouper and more. The weather has been nice with sunny days and evening showers. Still not many boats going out but there are some fish around. The 38′ Custom in Los Suenos had a couple good days recently. They caught a 75 pound roosterfish a couple days ago and yesterday they got into some nice sized yellowfin tuna. I have been really lazy about fishing lately but if the tuna move in we’ll be fishing this weekend. Panama recently restricted purse seine fishing boats to outside 200 miles…there is hope that Costa Rica will follow. 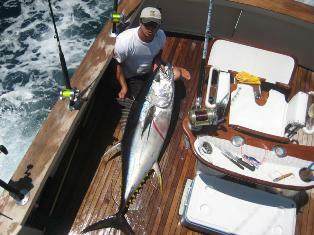 If this is done Costa Rica could have some of the best tuna fishing around. Contact billfish.org to find out how you can help. I talked to a guy today that caught a small blue marlin, 2 sails and a couple mahi mahi yesterday. He fished about 30 miles offshore and said it was a little choppy in his 32′ express but not too bad. I get emails everyday from people that are price shopping and looking for the cheapest deal out there. The reality of sport fishing in Costa Rica is fuel is $5 plus per gallon. So with all the other cost involved if someone is discounting their listed price by more than 10% they are probably losing money. So for them to make money they have to cut back on something…that something is fuel. They will then take you out 10 to 15 miles to fish instead of going out where the bite is…usually 25 to 30 miles out. You won’t catch much 10 miles out so instead of saving $250 you end up wasting $500 and you go home with negative feelings about Costa Rica fishing. There are lots of guys in Costa Rica that don’t care about repeat business or referrals and they will promise you anything as long as they get your money one time. I apologize for the lack of reports the past few days…the modem provided by our internet company quit working on Friday and you can’t get anything done during the weekend. I hope to get caught up on emails later this afternoon after I return from the marina. Not a bunch of action in the marina Los Suenos…there was a group on the 32′ custom and they caught 20 yellowfin all 20 to 40 pounders. I did hear they kept all the tuna for themselves and did not share with the captain and crew. The rule down here is the fish does belong to the client and it is common courtesy for the client to offer some of the catch to the captain or crew. You can’t sell your fish down here and it’s not easy to ship home. You can find dozens of small restaurants that will cook up your catch and serve it with some rice, beans, veggies and salads on the side. The 28′ center console did a half day at the 26 rcok and the couple caught some wahoo, some small yellowfin and a 30 pound mahi. 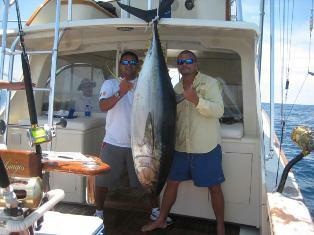 The owner of the 60 ft in Los Suenos called me today and said they are going to start doing a special swordfish trip. You will leave in the morning…run 25 miles out then troll another 30 or so miles fishing for sails, marlin, tuna, mahi and wahoo along the way. At night they’ll fish for swordfish and what ever else bumps in the night. The next morning you will start trolling back towards Los Suenos fishing until you get about 25 miles out and then they will run in. So it’s really like 3 full days of fishing for the price of two…fishing in waters that are lightly fished by private guys and never fished by charter boats. The price is $6500 and includes food, drinks, snacks, bait. 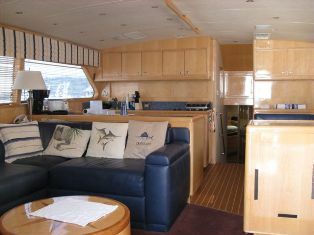 The boat is normally $3200 for 9 hour day offshore. This is fishing in luxury…last fall I watched Texas and Oklahoma play college football on direct tv while we were 30 miles offshore on this boat catching yellowfin tuna, sailfish and mahi mahi. The AC was so cold I needed a blanket as I napped on the leather couches. There maybe nothing better than college football and fishing offshore…spoiled. They are going on a exploratory trip and said I may get an invite. A father and son did a half day trip on the 28′ center console today. They went down to the 26 rock and caught 3 mahi, a yellowfin tuna and a bunch of skipjacks. 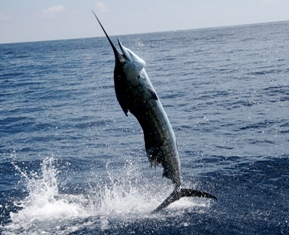 You are currently browsing the Costa Rica Fishing Reports blog archives for August, 2010.